While some misinformation is still floating around the Internet, using Amazon’s Associates Program on social media platforms is completely allowed. However, there are a few things to be cognizant of, just like using the Amazon affiliate program with a blog, to ensure good standing and a healthy relationship. We’ll dive into the three main tenets to remember when posting affiliate links on social media, as well as a few bad ideas and attempt to clear up some ambiguity in regards to using Amazon links on YouTube, Facebook and their social media peers. Please note that while we’ve organized and summarized some of the most common questions in regards to posting affiliate links on social media, there is no substitute for being familiar with Amazon’s Affiliate Operating agreement and Program Policies that dictate the use of their affiliate program. If you haven’t yet, we’d strongly encourage you to review those. Additionally, Amazon’s Resource Center recently published an incredibly helpful guide to sharing links on Social Media that we’ll quote from periodically below. Can I put Amazon Affiliate links on Youtube? Do Amazon Affiliate links work on Facebook? Can I use Amazon affiliate links on Pinterest? Yes! We hear these questions all of the time and one of the great things about the Amazon affiliate program is its versatility. While “offline” use (email / ebooks / PDFs) isn’t allowed, Amazon is quite okay with you sharing your affiliate links with your audience on social media channels, though with a few caveats. 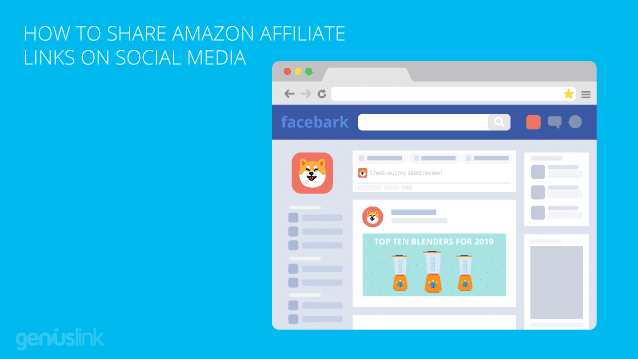 Further due to the nature of an Amazon affiliate link, they can be used across the many different social media platforms, and through third-party tools, to make product recommendations and earn commissions. Amazon explicitly states, “You can share on social networks where your readers are” and goes on to elaborate by saying “…what you’re allowed to use on your website is what you’re allowed to use on your social media feeds.” via their recent guide to sharing links on social media. Can I use third-party tools to create and share posts? This simply boils down to ensuring transparency and building trust when you share a link and this is actually a lot easier than it sounds. Amazon says, “They will trust you more if you are transparent about where you are directing them.” (source) and we wholeheartedly agree. This is done by simply including a mention of “Amazon” in close proximity of any link you share on social media to let your audience know where a link is directing them. This can be the word “Amazon” after the link or including Amazon in the call to action before the link. Sharing an Amazon affiliate link on social media should include a mention of “Amazon” nearby. Another option to ensure compliance, not only with link cloaking but also with including an affiliate disclaimer (discussed next), is to use a “Choice Page” – an optimized landing page that is built to ensure Amazon compliance and encourage interested consumers to buy. Find more information about Choice Pages and the various ways they can be used. Transparency is important! Not only for your audience (to inspire trust which leads to higher sales and conversions), but also Amazon (see the previous section) and the Federal Trade Commission (FTC)! This means it is not only important to note “Amazon” next to your links but to also disclose you are using the Amazon Associates Program and posting Amazon affiliate links. In order to do this Amazon strongly recommends you use this sentence — “As an Amazon Associate I earn from qualifying purchases.” — to stay in good standing with the FTC (which requires “that material connections between advertisers and endorsers are disclosed to customers”) and to also keep Amazon in good standing with the FTC. Again, if you’d rather avoid including this info on your social media profile we’d encourage you to use our Choice Page tool that includes an affiliate disclaimer built into the page. The third tenet of using Amazon affiliate links among your social media channels is to ensure you list where you plan on using your links. This is done in the Amazon Associates Central dashboard. You may not remember this step when you first signed up for the Amazon affiliate program but that’s okay as it’s easy to jump back in and make the addition. 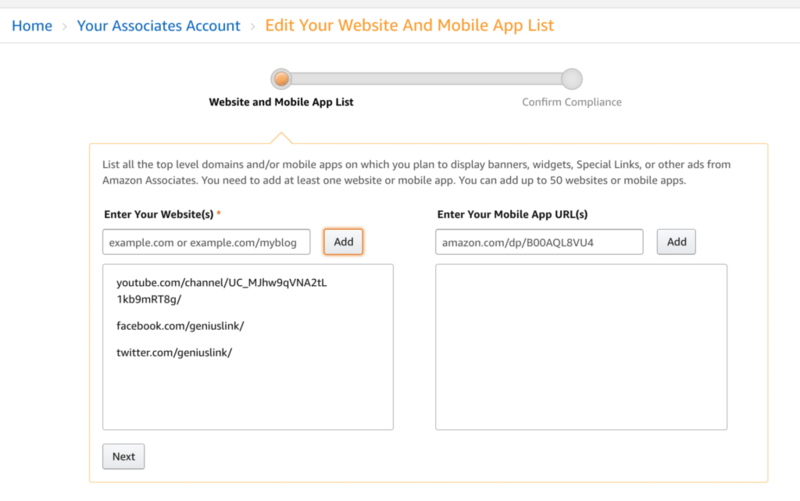 Go to Account Settings then “Edit Your Website And Mobile App List” to include all of your social media channels, as well as your websites/blogs. Be sure to list the websites and social media channels you plan on including your affiliate links in. Be sure to include “geni.us” if you’re are using Choice Pages. While very repetitive, we also encourage you to update the website list on EACH of the Amazon Associates Central dashboards you are active in (eg. affiliate-program.amazon.co.uk/ if you are using the Amazon.co.uk affiliate program and associates.amazon.ca/ for the Amazon Canada affiliate program). No one likes spam and spamming affiliate links isn’t good for anyone. As a result, Amazon’s affiliate program makes the requirement that you only post links when “You are the sole moderator of the account that you plan to post to” (source). This means that posting your affiliate links in forums, groups or in replies / comments isn’t cool. Amazon employs an intense review process to ensure compliance within their affiliate program and in order for that process to work it’s important that your links are posted somewhere public and widely accessible. If Amazon’s compliance team can’t access your link to review them then you’ll likely be getting one of those dreaded emails asking about “your referring traffic”. However, there is a solution to this – Choice Pages. Amazon elaborates on the above statement saying that it is okay to “use paid ads to send users directly to your participating Site…” where a “Site” can be a Choice page (but don’t forget to list “geni.us” on the Sitelist inside the Associates Central dashboard, #3 above). While it may seem like a good idea to mention that your channel is made possible by buying products on Amazon after clicking your affiliate links during the middle of your stream you are actually jeopardizing all of your hard work. Amazon specifically forbids this behavior in their Operating agreement. Amazon states “You will not offer any person or entity any… incentive…” in section 6 (g) of their policies. We’ve seen this specifically interpreted as not being allowed to ask people to click your affiliate links or buy random products after clicking your links as supporting you and your channel is considered an incentive. We encourage you to stick to recommending a specific product and if necessary mentioning that a link to purchase that product can be found in your show notes, video description, or comments. Taking that one step further Amazon also states “You must not encourage customers to bookmark your Special Links.” in section 2 (b) of their Policies page. There isn’t much room for confusion on that one. Please don’t do it! Social media is has become an incredibly powerful medium and the various social media platforms have become amazing places to build and curate an active and engaged audience. This, in combination with affiliate marketing, creates unique opportunities to open up significant revenue streams that weren’t there a decade ago. But with great opportunity comes responsibility (just ask Mark Zuckerberg) so please be mindful when sharing your affiliate links across your various channels. Good luck and please let us know if you have any questions. We look forward to helping you become even more successful.